Western Reserve College opened in 1826. It was the first institution of higher education in what had been the Connecticut Western Reserve in northeast Ohio. Western Reserve College was closely affiliated with the Presbyterian Church. Religious groups operated many early colleges in Ohio. They hoped to instill good moral values in their students and create missionaries to seek and convert new members. Originally established at Hudson, Ohio, Western Reserve College moved to Cleveland in 1882. It was one of the first colleges in Ohio to admit African-American students. During the 1820s and the 1830s, Western Reserve College became an important center of anti-slavery sentiment in Ohio. In the early 1830s, abolitionist Theodore Dwight Weld visited the school and recruited several faculty members to the anti-slavery cause. 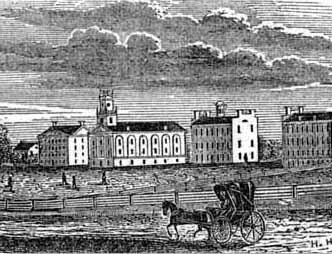 In 1833, Western Reserve College organized the first abolitionist society in the former Connecticut Western Reserve. The school's anti-slavery activities upset many residents of northeast Ohio. During the 1830s, Western Reserve College also built the first collegiate astronomical observatory west of the Appalachian Mountains. It was only the second observatory at a college in the entire United States. In 1892, Amasa Stone donated a sizable fund of money to the institution. As a result of this gift, Western Reserve College became Adelbert College of Western Reserve. Adelbert was the name of Stone's son. In 1967, Adelbert College and Case Institute of Technology merged and created what is now Case Western Reserve University. Cramer, C.H. Case Western Reserve: A History of the University, 1826-1976. Boston, MA: Little, Brown and Company, 1976.